Lay an outsized piece of wrapping on your counter (I ironed 2 long sheets along at the sides to make one larger sheet). Unfold the primary sheet of puff pastry within the center of the plastic, then roll it into a 10x12-inch parallelogram. unfold with one 1/2 tablespoons mustard, deed a 1/2-inch approximate all sides. Lay vi ham slices on prime, overlapping PRN. Sprinkle with one cup cheese. beginning at the long (12-inch) edge, roll the puff pastry into a log. Trim the ends so they're even, then tightly wrap the log with the wrapping. Place within the white goods for twenty minutes. Repeat with the second sheet of puff pastry and remaining mustard, ham, and cheese. heat up your kitchen appliance to 375 degrees F and line 2 baking sheets with parchment paper or polymer baking mats. Once the log has chilled, employing a sharp, notched knife, fastidiously cut every log into 1/2-inch-wide slices. (If every log is twelve inches, you'll get twenty four rolls from every one). prepare the rolls one in. apart on the ready baking sheets. Bake till the puff pastry is lightweight golden brown and therefore the cheese is hot and bubbly, concerning eighteen minutes. at once sprinkle with sliced thyme, parsley, or chives as desired. Let cool slightly. Serve heat or at temperature. 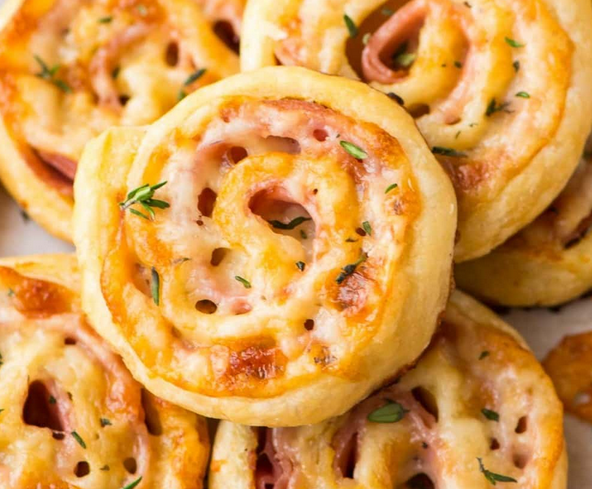 0 Response to "Ham and Cheese Pinwheels"